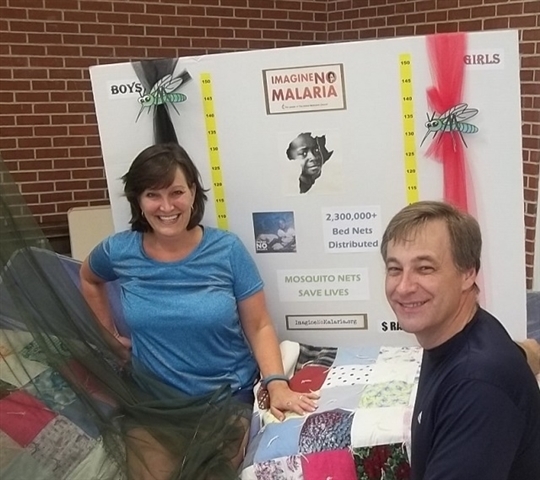 Children participating in Lake Vista UMC’s Vacation Bible School pooled their resources and raised close to $300 in support of Imagine No Malaria. The money will be used to purchase mosquito nets to help children in Africa. Mary Ellen Herbert, chair for the jungle safari themed VBS, and Rev. Woody Hingle are pictured in front of a challenge board designed to track which team could collect the largest amount of funding. In a hotly contested race, “boys against girls,” the children enjoyed watching the amounts climb every day during VBS.